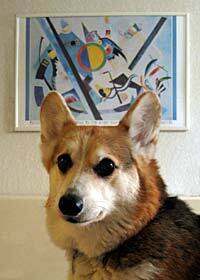 Do you think Kandinsky may have been inspired by a Corgi? The most wonderful thing happened today. Pizza came to me! The doorbell rang, and a guy handed us a pizza! Oh, such joy. One of my favorite foods showed up on our doorstep. I bet it’s because I thought about pizza so very, very hard. I haven’t been this happy since the last time it happened. Grapes are fun. Is it a ball? Is it a food? It’s both! You can play with it and then eat it! Another fun activity with grapes is to roll on one, smashing it into the carpet. Or you can hide them, then much later, have a yummy raisin snack. Make sure the vacuum cleaner doesn’t find out about your secret stash.